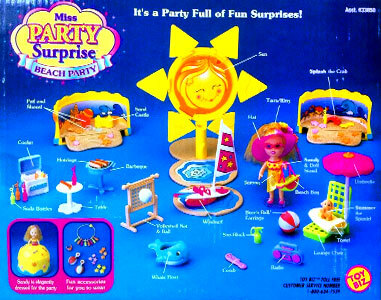 Images on this page thanks to Knot a Toy, Spiral Toy, Flickr member Piper Reaper, Etsy seller That's So 90s, Amazon seller chuckntamie and various eBay sellers! 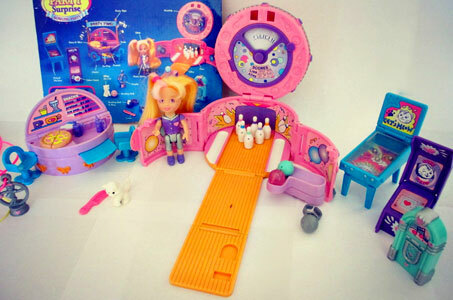 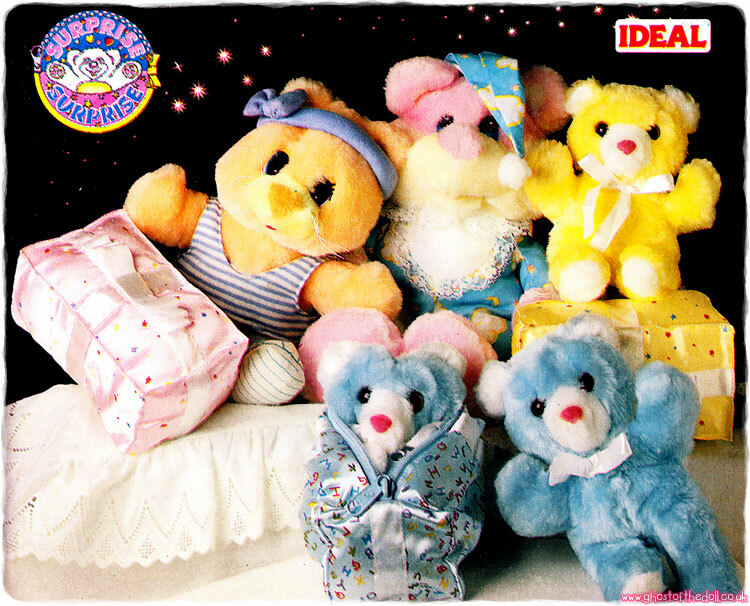 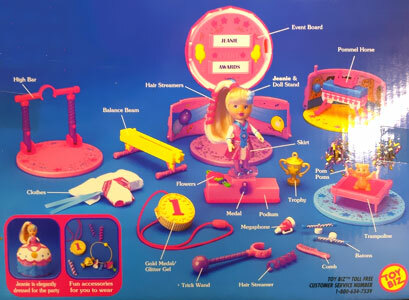 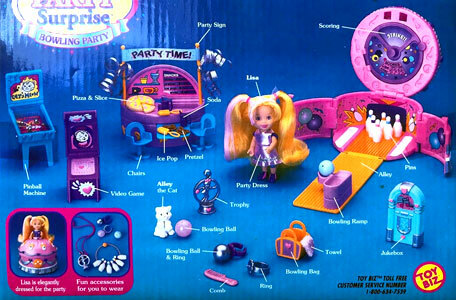 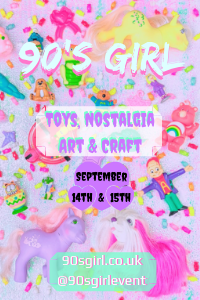 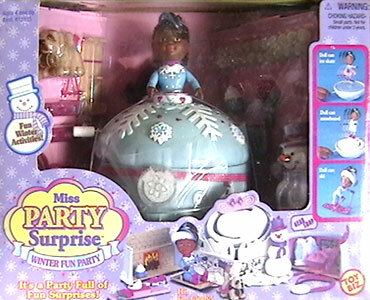 There were several different sets produced in 1999, and most, if no all, were available in both black and white doll versions. 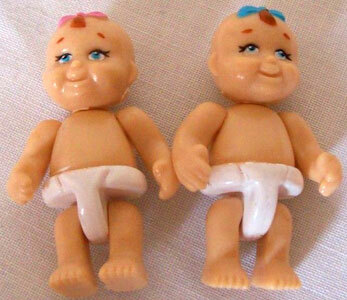 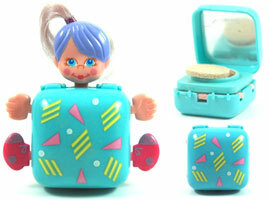 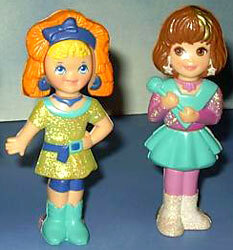 All dolls had molded on tops, which differed for each playset. 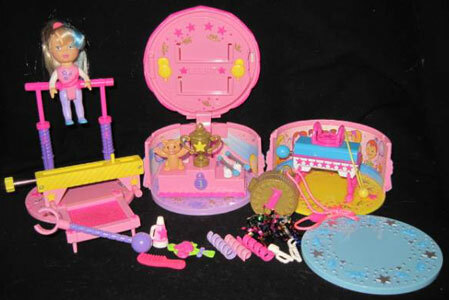 Some were scented. 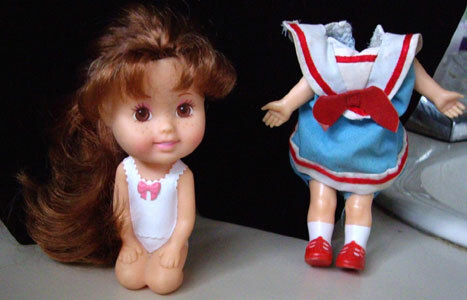 The later dolls produced in 2002 re-used some of the older moulds, which can be seen side by side for comparison on the 2002 Dolls page (towards the bottom). 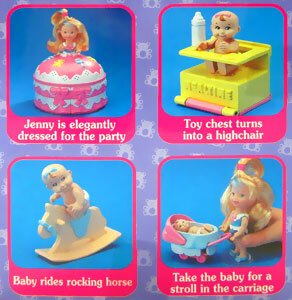 Baby Party came with a doll named Jenny and was baby powder scented. 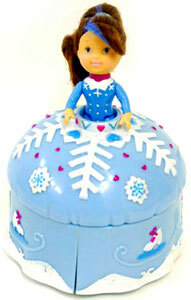 The mould was reused for one of the 2002 sets (name unknown as yet). 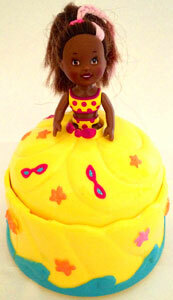 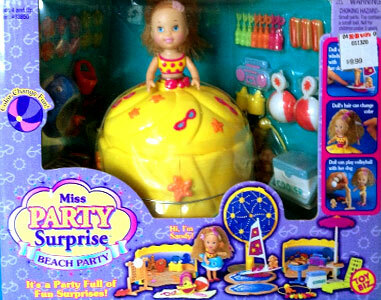 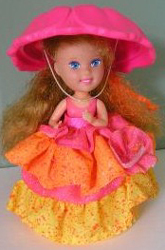 Beach Party came with a doll named Sandy with colour-change hair. 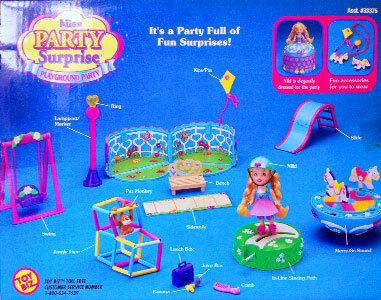 The mould was reused for two 2002 sets (Luau Party Set & Pool Party Set). 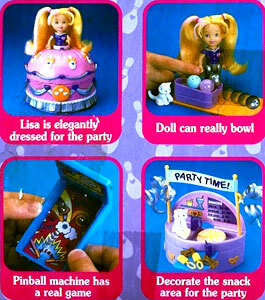 Bowling Party came with a doll named Tina. 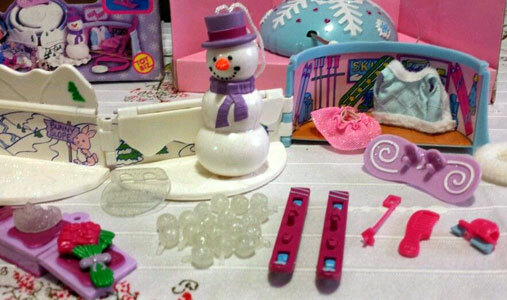 The mould was reused for the 2002 Bridal Party Set. 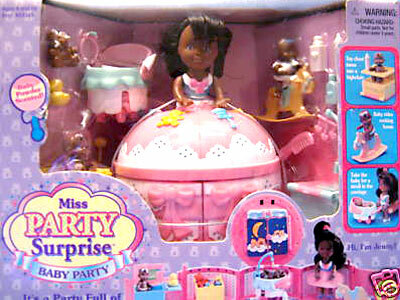 Dance Party came with a doll named Kristy. 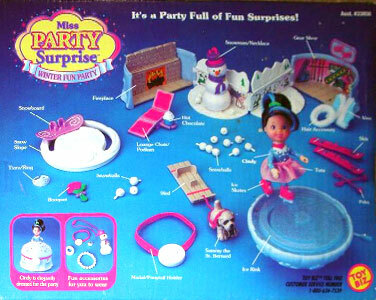 The mould was most likely reused for a 2002 set, but I have yet to find it. 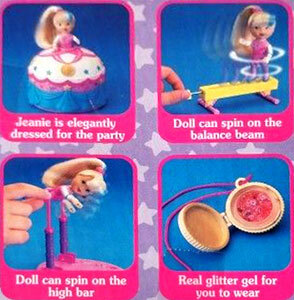 Gymnastics Party came with a doll named Jeanie. 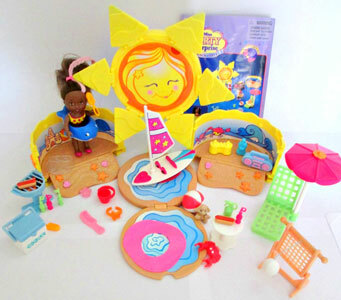 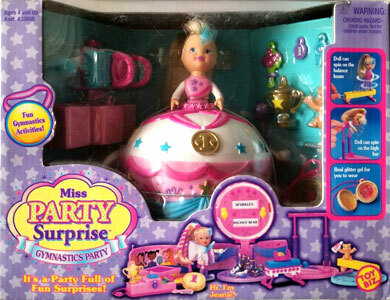 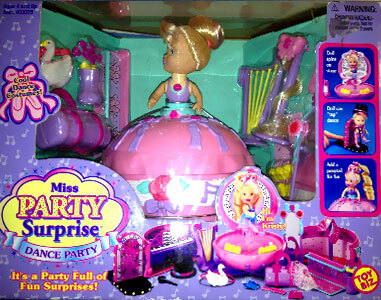 The mould was reused for the 2002 Super Star Party Set. 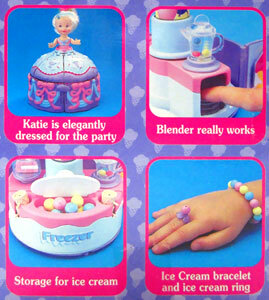 Ice Cream Party came with a doll named Katie and was vanilla ice cream scented. 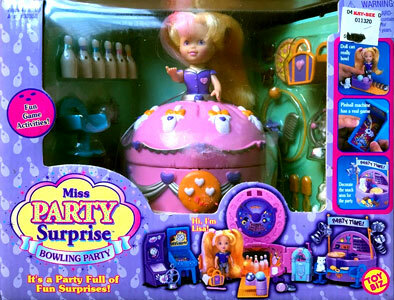 The mould was most likely reused for a 2002 set, but I have yet to find it. 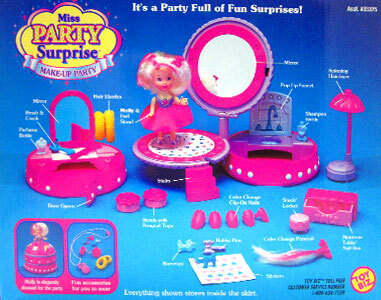 Make-Up Party came with a doll named Molly who had colour-change hair. 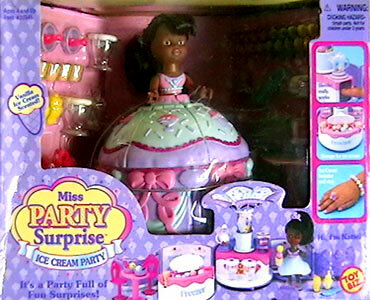 The mould was reused for two 2002 sets (Glamour Party Set & Hollywood Star Party Set). 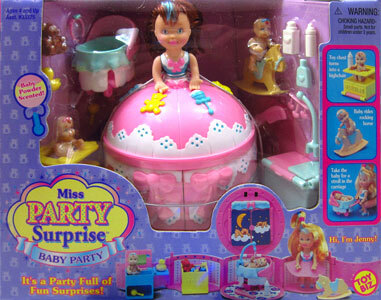 Playground Party came with a doll named Niki. 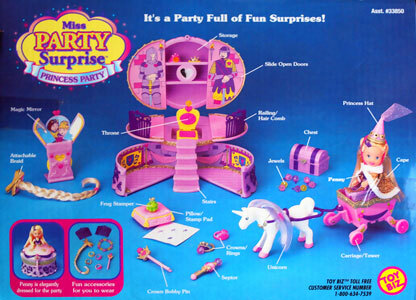 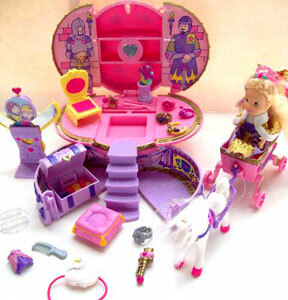 The mould was reused for the 2002 Pony Party Set. 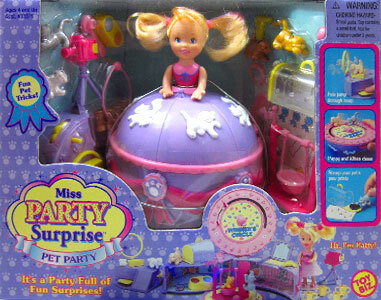 Pet Party came with a doll named Patty. 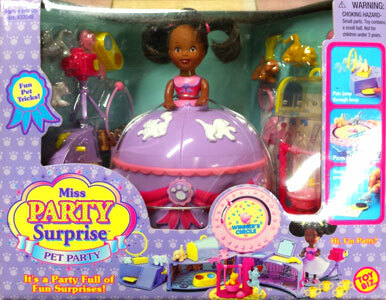 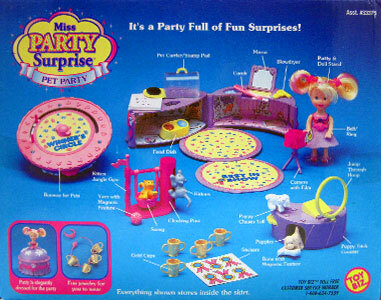 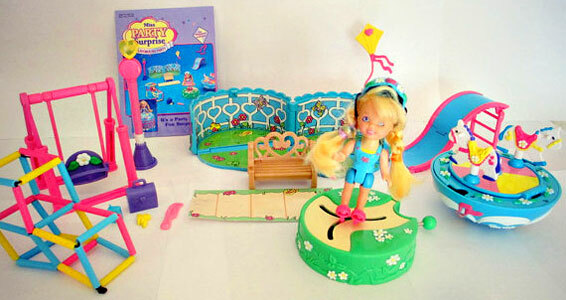 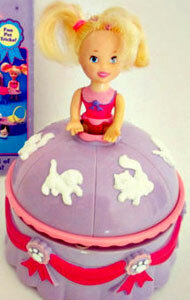 The mould was reused for the 2002 Pretty Pet Party Set. 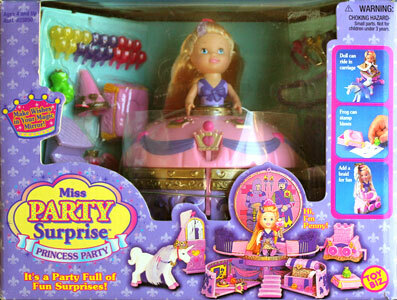 Princess Party came with a doll named Penny. 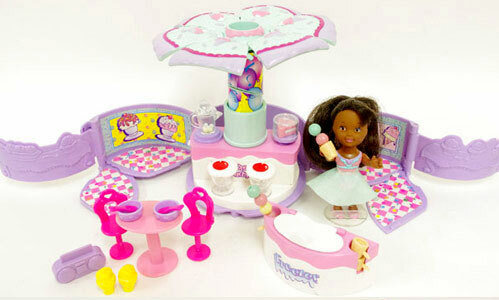 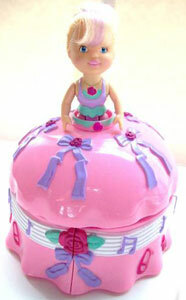 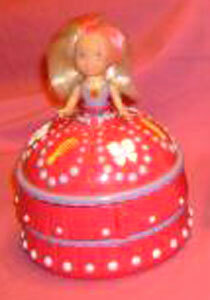 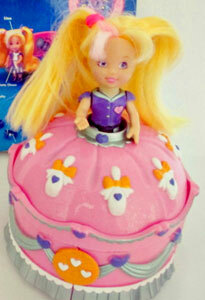 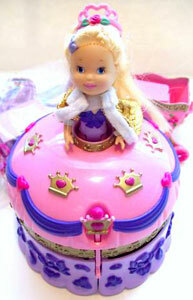 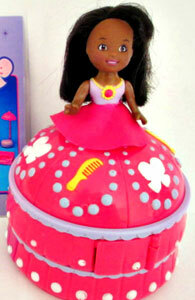 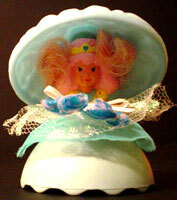 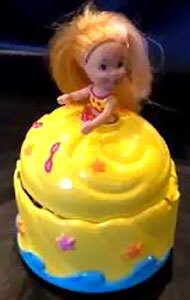 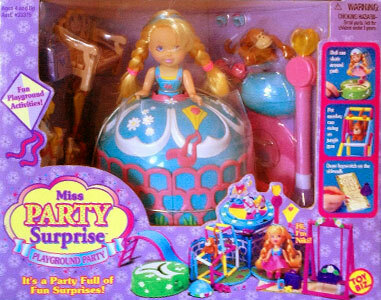 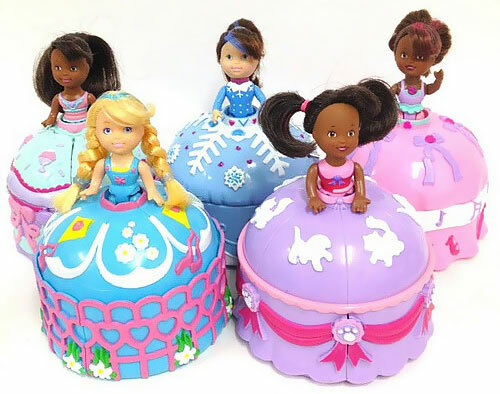 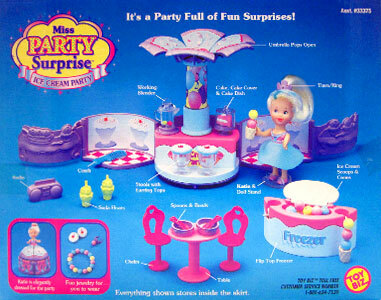 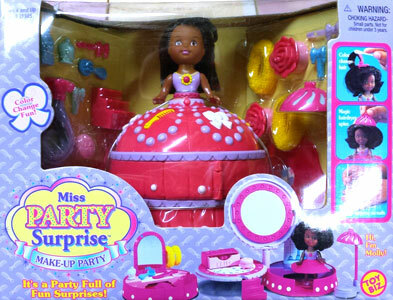 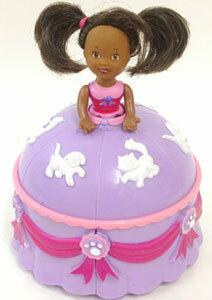 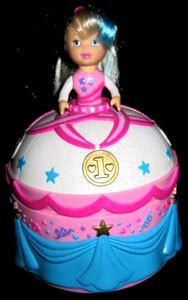 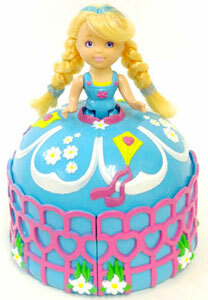 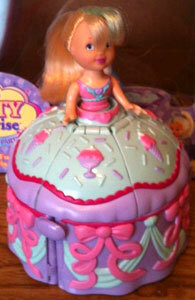 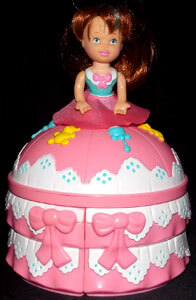 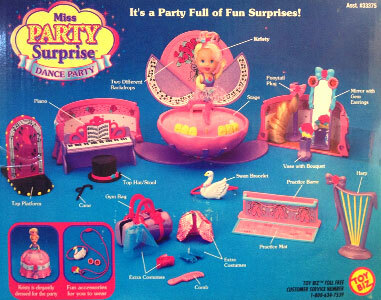 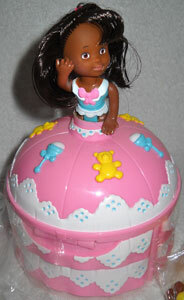 The mould was reused for the 2002 Pretty Princess Party Set. 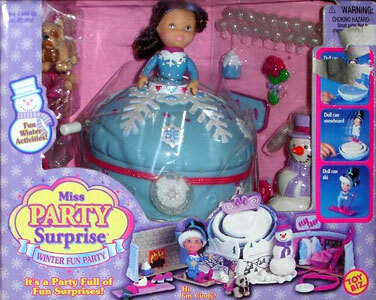 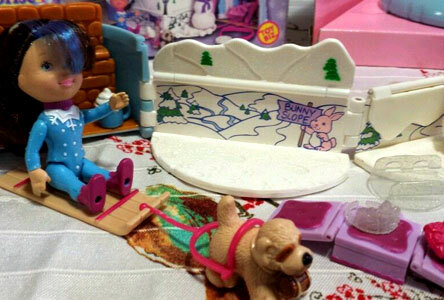 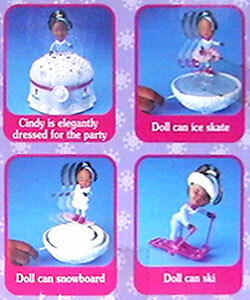 Winter Fun Party came with a doll named Cindy. 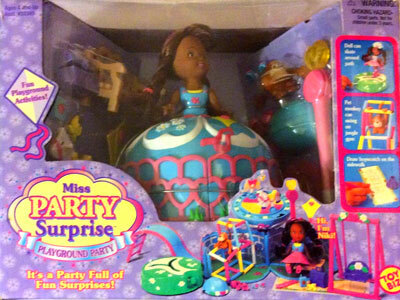 The mould was most likely reused for a 2002 set, but I have yet to find it.